The bug which affected Tottenham before their game at West Ham was not caused by food poisoning at their hotel, the Health Protection Agency has ruled. The players ate at the London Marriott hotel in West India Quay before they lost 2-1 at Upton Park on 7 May. An investigation into the hotel's food preparation, storage and cooking found it to be satisfactory. Tests on the players showed one had a form of gastroenteritis which may have spread to the other players affected. Tottenham boss Martin Jol said his players were vomiting in the dressing room before the defeat which cost them fourth place in the Premiership and meant they missed out on a place in the Champions League. The tests at the hotel were the responsibility of a joint team involving the Health Protection Agency and the Environmental inspectors at Tower Hamlets council. They took food from the hotel kitchen linked to that eaten by the group and found it to be completely negative. Further samples taken from the hotel's waste bins identified a range of bacteria, as would be expected, but did not identify organisms which could have caused the outbreak. Colin Perrins, head of Tower Hamlets Trading Standards and Environmental Health said: "None of the results or findings indicated that food poisoning was the cause. "The likely cause of illness suffered by the Tottenham Hotspur staff and players was from a viral source." Dr Alex Mellanby, Consultant in Communicable Disease Control at the Health Protection Agency added: "The only positive finding in this investigation identifies norovirus, a form of viral gastroenteritis, as the cause of the outbreak. "We do not believe that this outbreak was caused by food poisoning from the hotel." A statement from the London Marriott hotel said: "Our management is very pleased that the hotel has been fully cleared of allegations of food poisoning. "The West India Quay Marriott co-operated fully with the Health Protection Agency, Tower Hamlets Environmental Health Department and the police during the investigations, and would like to thank the personnel at these agencies for their professionalism and support." Tottenham were unsuccessful in their attempts to get the match delayed or postponed and there could be the threat of legal action against the Premier League as to whether they followed the right procedure. 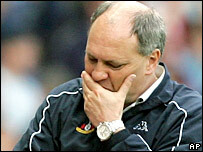 Jol has said the club will not appeal to the Premier League for the game to be replayed. Premier League chairman Richard Scudamore confirmed that he was not able to deem the match a "postponeable event" because Tottenham still had enough fit players to fulfil the fixture. Middlesbrough were docked three points in 1997 for calling off a match with 24 hours' notice, a punishment which sealed their relegation. And Jol said the club were mindful of that when they decided to go ahead with the game against West Ham. "We heard about the situation with Middlesbrough," he said. "We asked if we could postpone the game for three or four hours because the players had not eaten but that was not possible so we made the decision to warm up and after that everyone said they wanted to play." Tottenham were offered a two-hour delay to the kick-off but decided that such a decision would have made no difference to their predicament. But Jol, who nonetheless led Spurs to their highest Premiership finish of fifth, remained philosophical about the situation. "I can appreciate the reasons we could not postpone it," he conceded. "West Ham didn't want to play on Monday because they have the FA Cup final on Saturday. "It's always a thought that maybe we could have done better with a fit squad but I have to say to myself that it's all in the game. "We're in Europe and that's the main target but to be fourth for most of the season and to lose it on the last day is a big disappointment. We're gutted."